Here are some of my observations from around the league and after the Eagles 28-3 victory over the Jacksonville Jaguars. 1. I think the Eagles have great team chemistry. A great example of this was shown on Sunday as backup quarterback Kevin Kolb cheered on his replacement in Michael Vick. It takes a big man to sit on the sidelines and cheer for the guy that just made him the backup. Especially after Kolb was promised the starting position since April. Moreover, the Eagles are a much closer squad this year compared to Donovan McNabb’s final season. 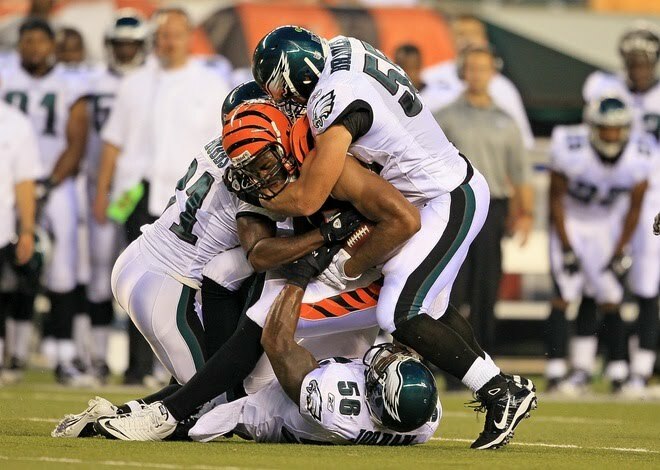 Maybe former Eagle Sheldon Brown was right about the chemistry issues the team endured last year. 2. 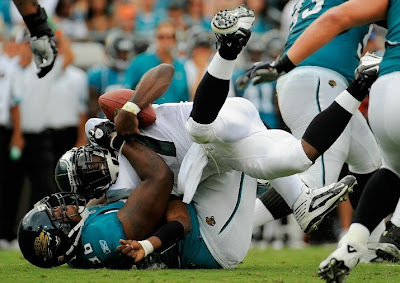 I think the return of middle linebacker Stewart Bradley was the most overlooked topic heading into the Jaguars game. He was a major reason for the Eagles’ defensive success against Marcedes Lewis and Maurice Jones-Drew on Sunday. In the 11 games that Bradley has started (and actually finished the game), the defense has held opponents under 21 points in 10 of those 11 starts. More importantly, his skills permit defensive coordinator Sean McDermott to be more flexibly with his playcalling. Bradley can shutdown opposing team’s running backs and tight ends, which allows for more exotic blitzes and pressure on the quarterback. 3. I think the Eagles need to recognize that the middle linebacker is a very significant position in their defense. For years, former defensive coordinator Jim Johnson and Andy Reid claimed linebacker was the least important position on the Eagles scheme running efficiently. However, the seasons where the Eagles defense has struggled, they have had Omar Gaither, Levon Kirkland, Mark Simoneau and Will Witherspoon roaming the middle. The years that the Eagles defense has finished in the top 8 of the league, they have had Jeremiah Trotter and Bradley. The reason is quite simple; they have the bulk and talent to be Pro Bowlers. 4. 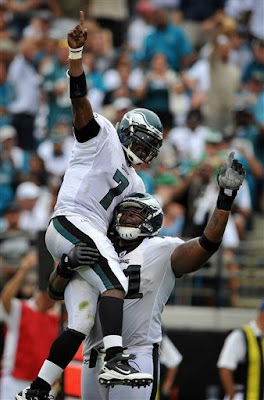 I think everyone sees why head coach Andy Reid made the decision to hand the reigns over to quarterback Michael Vick. At the end of three weeks, the Eagles sit alone atop of the NFC East standings at 2-1. Dallas, Washington and New York are all 1-2 with huge problems. Of course the Eagles have their own set of concerns, but they have an exceptional shot at winning the weak NFC East. Without a doubt the Eagles have not faced the toughest part of their schedule yet, but they are winning the games they are supposed… That’s more than anyone else in the NFC East can say. 5. I think the Eagles still have major issues along the offensive line, but it could be due to lack of playing time together. Remember the five-man unit that took the field on Sunday had not played a single game together. Not in the preseason, not ever. As the season progresses, they will gel with each other and become better as a unit. That doesn’t mean the Eagles shouldn’t look to upgrade the right guard, right tackle and center position this offseason. 6. I think the biggest hole along the offensive line is center Mike McGlynn. Teams are sending blitzers up the middle and getting to Vick. McGlynn must do a better job of picking up defenders otherwise the Eagles will be forced to play Nick Cole at center. Although Kevin Mawae is on the open market and he would be a nice stopgap for a year until Jamaal Jackson returns. 7. I think all the hoopla leading up to and surrounding Redskins QB Donovan McNabb’s return to Philadelphia will be better than the actual game. The Redskins defense gave up 30 points to rookie quarterback Sam Bradford. Moreover, he didn’t have the services of RB Steven Jackson for the second half. Even with Jackson healthy, the Rams do not have a high-powered offense like the Eagles encompass. 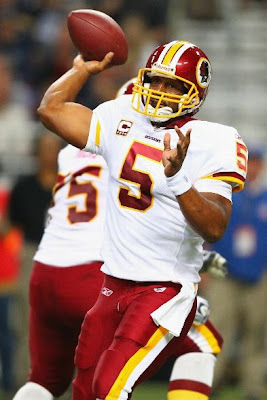 Additionally, McNabb does not have the weapons that he possessed in Philadelphia. While Santana Moss, Clinton Portis and Chris Cooley are nice players, they are no DeSean Jackson, Jeremy Maclin or Brent Celek. 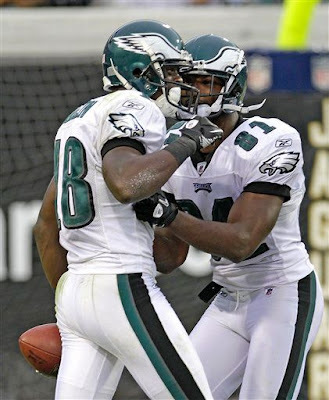 Still, the Eagles should not underestimate how badly McNabb and his teammates want to win this game for him. 8. I think wide receiver Jeremy Maclin has finally arrived. In just three games, Maclin has scored four touchdowns, which matches his season total from his rookie year. In addition, Maclin is running smoother routes and is becoming a force inside the red zone. Needless to say, Vick is gaining a lot of trust in Maclin. Gaining trust from your quarterback usually takes a season or two. Maclin has done it in just three games with Vick under center. 9. I think the Eagles’ fullback Owen Schmitt has done an adequate job in replacing the injured Leonard Weaver. Schmitt has been great at picking up blitzer and a good lead blocker for RB LeSean McCoy. While he will never replace the All Pro fullback in Weaver, he should get even better as he gets more acclimated to the Eagles’ west coast offense. I suspect he will get a receiving touchdown sooner rather than later. 10. I think much of Eagles red zone success is due to Michael Vick, but also because of offensive coordinator Marty Mornhinweg. Mornhinweg is using Vick’s arm and legs to catch teams off-guard. He has done an excellent job at disguising the QB draw, running plays and throws. Thanks to Vick’s newfound accuracy and pocket presence, Mornhinweg can make teams worried about Vick running and throwing the ball. With Vick leading the way, the team has scored seven touchdowns in their last eight red zone trips. If Vick can continue to be a 60 percent passer, teams will have trouble stopping the Eagles inside the 20. 1. I think the Steelers beat the Ravens this week to enter their bye week at 4-0. That would be the big surprise considering they have done it without Big Ben and the services of Charlie Batch and Dennis Dixon. There defense has return to being one of the scariest in the league and Rashard Mendenhall is carrying the load. The main reason I see the Steelers coming away with the victory is due to the health of Ravens running back Ray Rice and the team’s fascination with the pass. In the last meeting of the year against the Steelers, Rice ran close to 150 yards. If he is unable to go, the Ravens will miss his ability to wear down the Steelers defense. Also, the Ravens defense gave up 144 rushing yards to Cleveland’s Peyton Hillis. The Browns kept the game close doing what the Ravens usually do to them…running the ball. (QB) Joe Flacco had an impressive stat line, but with an aging defense the Ravens must win the time of possession to keep the defense fresh. The Steelers have Mendenhall and they will surely expose the Ravens lackluster run defense. 2. I think the Dallas Cowboys are not going to be able to match the desperation they play with this past Sunday against the Texans. The Cowboys needed to come out and beat the Texans otherwise their season was on life support. While they won, it is hard to match that type of intensity week in and week out. 3. I think teams should not rely on game winning field goals and go for the touchdown. Yesterday, the Saints and Raiders lost due to their kickers missing two “easy” chip shots. If both teams didn’t settle for the field goals and put the game in the hands of their kickers, they could probably scored touchdowns and won the game. Now, they must endure heartbreaking losses that could loom large late in the season as they vie for first place and playoff positioning. 4. I think the Jets have finally allowed quarterback Mark Sanchez to become the passer he was destined and that they needed him to be. Over the past two games, Sanchez has thrown six-touchdown passes. Furthermore, he is getting the ball into his playmakers hands and not over thinking/analyzing what he sees on the field. He is simply taking what defenses are giving him. With second-year pro Shonn Greene struggling to run the rock, they were forced to put the ball in Sanchez arm. If he failed then the Jets were not going to make the playoffs. 5. I think the worst team in football might just be the Carolina Panthers and it is their ownerships fault. There are always serious issues when you allow a “lame duck” coach to finish out his contract. John Fox is a good coach, but he knows where he is not wanted. The rumors have been swirling about the Panthers being interested and flirting with former Steelers coach Bill Cowher. The team knows Fox will not be back and they are playing like it. 6. I think Chargers’ GM A.J. Smith might be looking for a new job the end of the season. The Chargers, who have the most talented team in the AFC West, sits two games back of the 3-0 Kansas City Chiefs. A major reason is due to Smith’s inability to make a move to help his team on the field. He needs to face facts that star wide receiver Vincent Jackson is not going to report to the Chargers. If he isn’t going to play then deal him and get players that could help you this year. Instead Jackson will skip the entire 2010 season and the offense will suffer. Furthermore, the Chargers franchise will get less for Jackson next year in the offseason. Bad handling of situations by Smith and a struggling team could mean he is on the hot seat. 7. 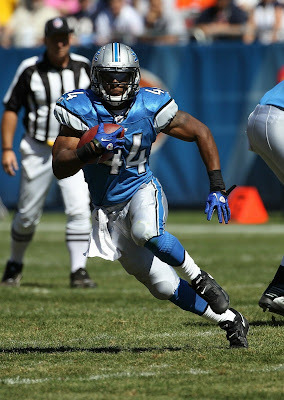 I think Detroit is seeing why selecting RB Jahvid Best was a risky move at the end of the first round. In college he was an extraordinary talent, but could never stay healthy. After two weeks, he looked like one of the best backs in the league just like he did at Cal. On Sunday, he suffered a significant toe injury, which might make him miss a good portion of the season. Best might go on to have a Pro Bowl caliber career, but he also could have an injury-plagued career like former Eagle Brian Westbrook. 8. I think the Green Bay Packers have a great chance to claim one of the NFC’s playoff byes with a win on Monday night against Chicago. The Packers still play the Lions twice. They also have their regular season bye week at the right time (week 10). More importantly, the Packers get cornerback Al Harris back around week seven, which should vastly improve their defense for the toughest part of their schedule. 9. I think the feel good story of the weekend has to be running back/kickoff returner Leon Washington’s huge game. Washington tore his ACL in 2009 and then the Jets traded him this offseason to Seattle. On Sunday, Washington returned two kickoffs to the house (102 yards and 99 yards). He now holds both the Seattle and New York franchise’s records for the longest kickoff return. He could be this year’s Joshua Cribbs. 10. 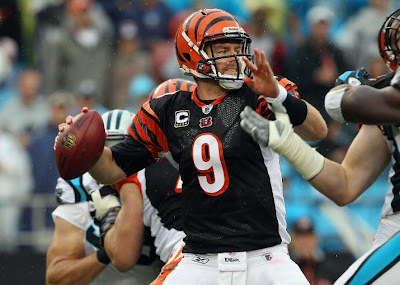 I think quarterback Carson Palmer could be the most overrated quarterback in the league. Yesterday, he has a 22-percent QB rating in the first half, which also included two interceptions. Palmer has all the weapons at his disposal with Jermaine Gresham, Chad OchoCinco and Terrell Owens. However he continues to be a shell of his former self. He was once a highly touted quarterback, but he just has not been the same since his ACL injury in the playoff game against the Steelers a few years ago. Great to be on top, the organization made a great decision to go for it this year presumably after looking at the rest of the division's problems. It bodes well for the team with what Maclin has shown early on this season. If any body doesn't realize it they should watch the Monday night game tonight, great matchup with history and current play.